And now, he’re my coverage of Spider-Man: Homecoming:Before Spider-Man: Homecoming was released, I didn’t expect a great deal from it. I didn’t think it’d be terrible, but also it felt to me like Marvel was trying to throw together a film in an attempt to justify the proprietorial battle with Sony over the rights to the characters. It didn’t help when the director was announced to be Jon Watts, otherwise known as “I’m sorry, who?”, who had previously only directed an Eli Roth-produced horror movie called Clown that I will never see, and the Kevin Bacon movie Cop Car, which I hear is fine but not of the Let’s-Give-This-Guy-A-Major-Blockbuster quality. I was so apathetic towards Homecoming‘s release that we didn’t even cover it on the Lambcast, something we’d done for every MCU film since Guardians of the Galaxy. It looked to be just another Spidey film, and we’d already had at least three too many of those, and I was not ready to yet again watch Peter Parker get bitten by a blue and red radioactive spider, lose his Uncle Ben and learn the cause-and-effect of great responsibility being an integral by-product of great power. I also wasn’t ready for Homecoming to be not just one of the best superhero films of 2017 (#3, after Thor: Ragnarok and The Lego Batman Movie), but one of the best movies of the year overall. Having established Tom Holland in the role and revealing the roots of the character in Captain America: Civil War, Homecoming was able to skip all the usual pitfalls so often stumbled upon with original stories. 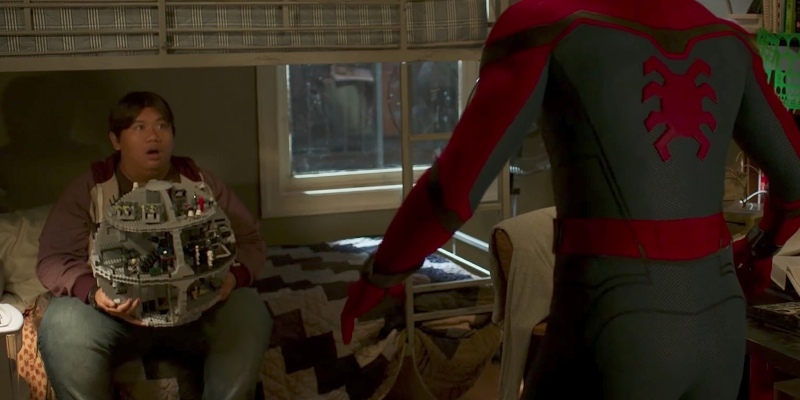 We were fortunately spared seeing Parker’s tragic backstory and first see him already fully spidered up and living with his Aunt May (Marisa Tomei) in a Queens apartment. I’ve never been a comics guy so it hadn’t bothered me too much in the past that his previous on-screen incarnations (Tobey Maguire and Andrew Garfield) have been far too old to accurately portray Parker, but I was appreciative of the fact that this time around Parker is a bonafide child, aged just 15 years old, still very much in school and suffering through everything that comes with that. Regardless of the on-paper backstory, it makes him refreshingly different to the rest of the MCU’s much more adult cast, and provides the freshest of meat to carry the franchise forward when some of the older hands throw in their towels very soon. For the record, those specific towels are probably a heavy, metallic red and yellow one, a round blue one with a star in the middle and a flowing yellow one made from Mythril or whatever they make towels from on Asgard. Homecoming is the definition of popcorn entertainment in that it’s immensely enjoyable from start to finish. With the Marvel franchise it’s planted firmly in the more comedic side of things (along with Guardians, Ant-Man and Ragnarok), and that’s just the right tone to set it in, especially given how familiar we as an audience are with the specific goings-of on Spider-Man and his world by now. 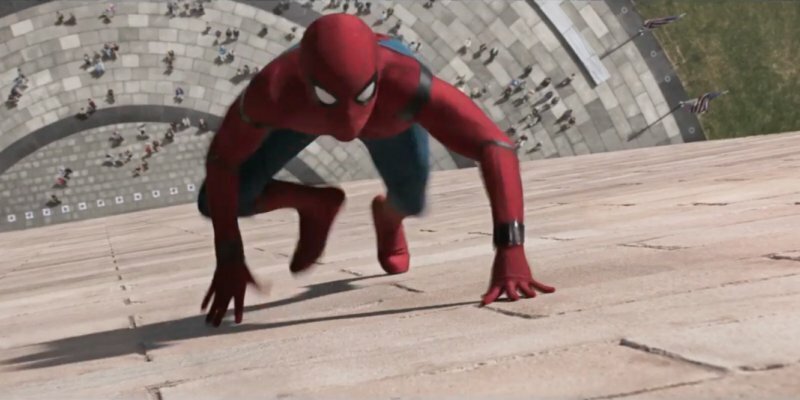 Therefore we get scenes where he’s running through the suburbs because there’s no tall building to swing across, and Parker discovering tricks and abilities as he goes and being fascinated by them because he’s literally just a kid. 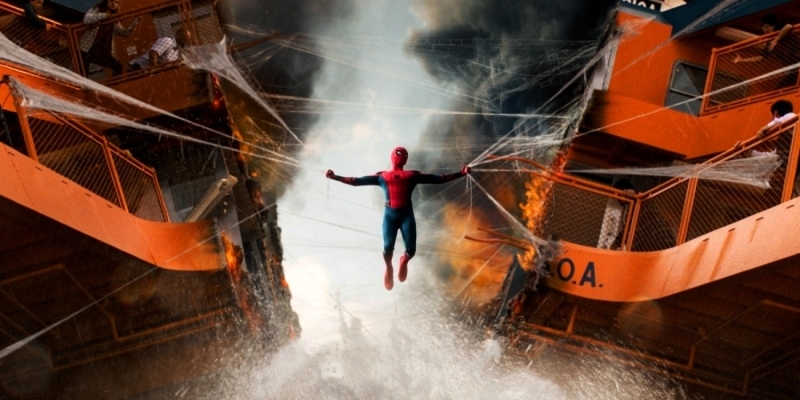 It could be argued that there are too many action set-pieces – if you count some of the smaller ones there’s at least six, with at least three being large enough in scale that they could quite easily have been the money-shot climax from the Sam Raimi era. That being said the action never feels like it overshadows the real story, that of Peter coming to terms with the fact that yes, he has super powers and has already fought against or alongside his childhood idols, but he’s not quite ready to take on national or global threats. As he is reminded by Tony Stark (Robert Downey Jr.), he should, for now at least, remain a friendly, neighbourhood Spider-Man, rather than biting off more that he can chew. Speaking of Stark, Homecoming is almost a standalone film when it comes to its MCU involvement. 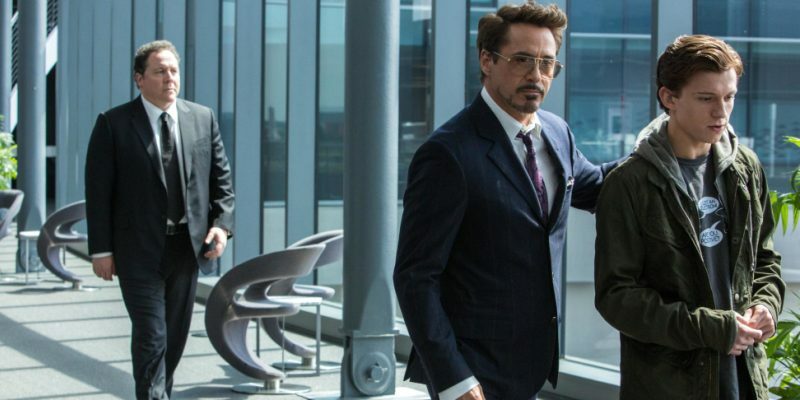 Sure, Tony plays an integral role as Peter’s mentor, with Jon Favreau’s returning Happy Hogan acting as a reluctant and begrudging point of contact between the two, and indeed the events of the film are heavily influenced by the goings-on of earlier films, particularly 2012’s Avengers Assemble. However I don’t think much of what happens within Homecoming will have too much of an impact on the rest of the franchise, other than having developed Spider-Man and his abilities in preparation for his apparently heavy involvement in Infinity War, at least given the trailers. No, this film is more about how the actions of the big guys affects the ground-level working class folks, and it’s a lot of fun to have Peter and his friends (particularly Jacob Batalon’s Ned) be big fans of the Avengers. This is a world where kids draw cartoons of their favourite real-life super heroes, where the man in the Iron Man suit offers science internships, and where Captain America (Chris Evans) records educational videos for schools (speaking of which, it’s never been more essential to stick around all the way to the end for a post-credit sting). 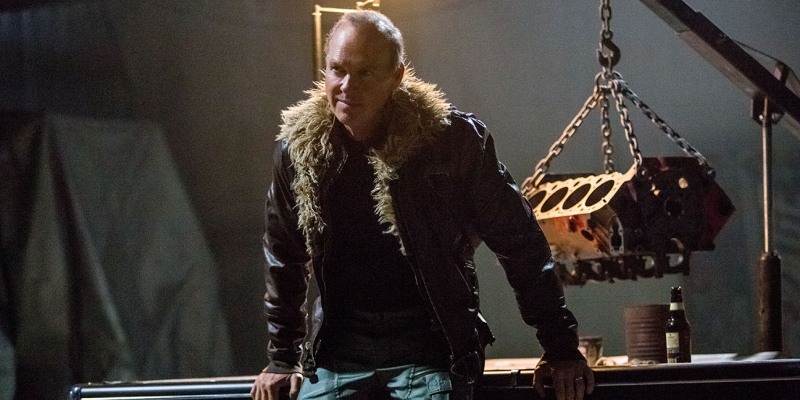 The villain here, Michael Keaton’s Adrian Toomes, is a contractor hired to assist in the clean up after the Battle of New York, only to have the work pulled out from under him by Stark’s own initiative, sending Toomes on a vengeful curve that leads to him becoming a black market weapons distributor, specialising in the alien tech salvaged from the numerous attacks. Spidey has a terrific and often absurd pantheon of villains, but Toomes, otherwise known as The Vulture, is a particularly great, grounded choice. He’s far more believable than the likes of The Lizard, Sandman or, um, The Spot, and like the best of Marvel’s villains there are several points in the story where it’s very easy to be on his side of the situation. In terms of looking forward at the future of Spider-Man, as a character he has the thickest plot armour of anyone else in Infinity War, given that there’s an as-yet untitled Spider-Man sequel scheduled on Marvel’s slate for July next year, within which it’s extremely unlikely that someone other than Peter Parker will be donning the new high-tech suit. Other than 2020’s Guardians of the Galaxy Vol. 3, no other characters have their own film’s on the schedule, so it’s a very safe bet to say that Peter Parker will emerge from the events of Infinity War relatively unscathed and in a situation very similar to his current one. That being said I am looking forward to that Homecoming sequel immensely, given the final scenes of this film and the relationships that will be affected by what has just been revealed. I enjoyed this movie. I have problems with the “eight years later” piece. However, I just ignore it and move on. I could chime in more on the movie, but I’m sure Jay covered it fine. For my additional thoughts, I wanted to give a shout out to a couple major milestones that this movie connects the dots on and Avengers: Infinity War will complete. 1. Chris Evans will have played Captain America in one movie a year for 8 straight years (and it’ll be 9 come next year with Avengers 4). Without his appearance in Spider-Man: Homecoming, this streak would not have been possible. 2. This year, Robert Downey, Jr. will tie Hugh Jackman for most appearances in movies as the same comic book character (DOWNEY: Iron Man, The Incredible Hulk, Iron Man 2, The Avengers, Iron Man 3, Avengers: Age of Ultron, Captain America: Civil War, Spider-Man: Homecoming, Avengers: Infinity War; JACKMAN: X-Men, X2, X-Men 3, X-Men Origins: Wolverine, X-Men: First Class, The Wolverine, X-Men: Days of Future Past, X-Men: Apocalypse, Logan). This sets him up to surpass Jackman in next year’s Avengers 4. Again, without Homecoming, this would not have been possible. This entry was posted in 09/10, Choose Film, Review, Unlisted and tagged Abraham Attah, Angourie Rice, Bokeem Woodbine, Chris Evans, Donald Glover, Garcelle Beauvais, Gwyneth Paltrow, Hannibal Buress, Jacob Batalon, Jennifer Connelly, Jon Favreau, Kenneth Choi, Laura Harrier, Logan Marshall-Green, Marisa Tomei, Martin Starr, MCU, Michael Chernus, Michael Keaton, Robert Downey Jr., Selenis Leyva, Spider-Man, Spider-Man: Homecoming, Stan Lee, The Avengers, Tom Holland, Tony Revolori, Tyne Daly, Zendaya by jaycluitt. Bookmark the permalink. Pingback: The Large Association of Movie Blogs | LAMBCAST #422: WHATCHA BEEN WATCHIN’ LATELY?